Metro rail systems are integral to modern life. With thousands of people commuting through them everyday, most subway riders do not realize the engineering marvels that allow them to get where they need to go. The simple fact that they are underground complicates everything from how they are designed to how they are maintained. This includes how the wastewater from subway restrooms is managed, and what the wastewater control panels, designed and installed by Electronic Control Corporation, take care of in some of Washington DC’s Metrorail stations. Anyone involved in the wastewater industry knows that it does not flow uphill, at least not without some help. In above ground circumstances, you flush it down and gravity takes it on down to the sewer and on through the wastewater treatment process. In subways, on the other hand, the only way for it to go is up. The DC Metrorail station restrooms, where ECC installed our wastewater control panels, use a system where a tank collects and holds wastewater until full, and then uses compressed air to push it up to the DC sewer system. Machinery breaks down, components break and eventually there is a mess of an outcome. It is one of those facts of life. But no subway maintenance team wants to find out about a wastewater system failure after the fact. When calls about a subway bathroom, flooded with sewage, come in, this means additional downtime and potential health hazards for subway riders. This is why the wastewater control panels that ECC installed are Ethernet capable, connecting over the Internet to the metro rail management system. The maintenance crew can now monitor the system without constantly visiting the panel, most likely buried somewhere, down in a subway utility room. 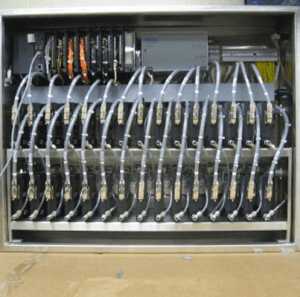 In addition, several wastewater control panel components have been installed to give notice of possible system failures and needed maintenance before disaster happens. One example is the current switches installed to monitor the amp draw of the compressor motors. If they begin pulling too much current, the control panel will send an alert indicating that one of the compressor motors could be ready to burn out. The system also monitors voltage to ensure that it is clean and free of surges and spikes. The ECC control panel is configured to automatically turn off if anything is wrong, preventing costly damage to the system. 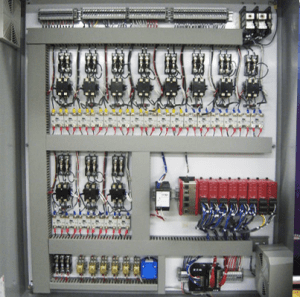 Through years of experience, we offer expertise on which components are the best to install on control panels. However, we understand that our customers may have their own project requirements and, or preferences. 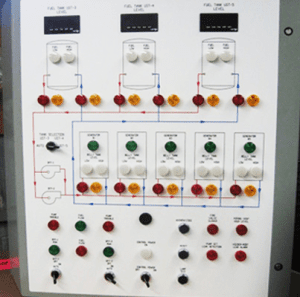 For this project, we made sure that the logic controller and touch screen selected by our client integrated seamlessly into the wastewater control panel. We normally use touchscreen controllers made by Horner Automation Group, that are high resolution, easy to use and have many connectivity options. 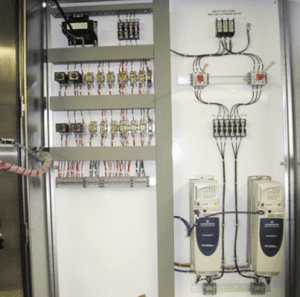 In addition to integrating the requested components, power supplies, contactors, and circuit breakers used for this project were by Eaton Cutler-Hammer, which are extremely reliable and cost efficient. Tried and true, Altech terminal and power distribution blocks were used. 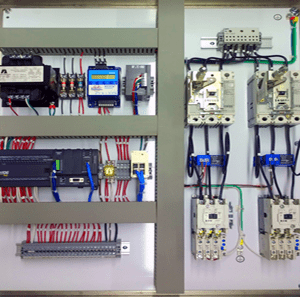 Electronic Control Corporation modernized this subway wastewater system to be more safe and reliable. The wastewater control panel now monitors and communicates critical information to those who need it before a failure occurs. So Metrorail staff now have peace of mind with this much more robust control panel. And the riders of the DC subway can continue their daily commutes with more access to restrooms that are in order.